If she were smart, if she were levelheaded, she would avoid any confrontation tonight and leave Innish in peace, no matter where she went. But she wasn't feeling particularly smart, or levelheaded - certainly not once the hours passed and the air in the inn shifted into a hungry, wild thing that howled for blood. "Fun?" Ansel opened her other eye. "Smearing all this gunk on our face is fun?" Celaena set down her pot of rouge. "If you don't shut up, I'll draw a mustache on you." She wished he'd punched her in the gut. It would have hurt less. Not trusting herself to keep from falling to her knees with shame right there, she just stalked down the hall. She'd never kissed anyone. And as her lips met his and he wrapped his arms around her waist, pulling her close against him, she honestly had no idea why she'd waited so long. His mouth was warm and soft, his body wondrously solid against hers, his hair siren as she threaded her fingers through it. Still, she let him guide her, forced herself to remember to breathe as he ease her lips apart with his own. I've had Throne of Glass on my shelf for years and have yet to read it - shameful, right? Well, when it was picked as our January Read Along, I knew I had to read The Assassin's Blade first. They're prequel novellas, there was no way I was going to start a new series without all the information! Rather wise decision on my part. I immediately knew I was going to love Celaena. She is that strong badass heroine that any woman, and man, can look up to. She knows who she is and what she stands for. We don't know much about her past prior to Arobynn finding her and training her to be Adarlan's Assassin, but I have a feeling the past will be revealed in prior novels and the mystery is killing me! These five novellas allow us to learn who Celaena is and understand her motives a bit more while reading Throne of Glass - yes, I immediately read Throne of Glass after finishing The Assassin's Blade. Not sure how you wouldn't be able to do such a thing! While all together these stories are a rather decently sized full novel, they stand on their own and create an excellent prologue. 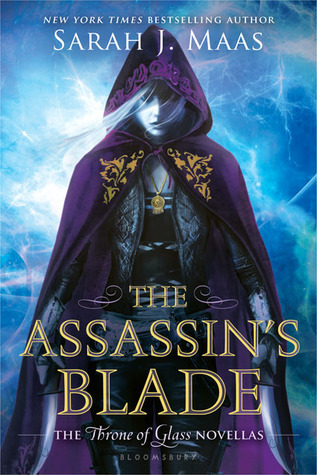 If you are a Throne of Glass fan, or are looking to start this series, I cannot recommend The Assassin's Blade enough - it really is the perfect beginning to what is shaping out to be an amazing series.